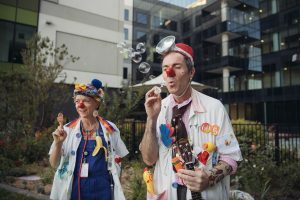 We are providing $50,000 to the Humour Foundation to fund two Clown Doctors to attend the burns clinic at the Royal Children’s Hospital for 50 weeks in 2018. 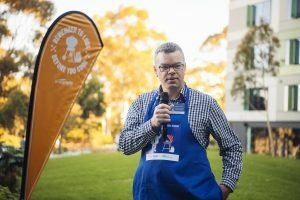 The launch of the partnership at the RCH on 13 December 2017 was held in conjunction with the launch of our Look Before You Cook (BBQ safety) summer campaign. Director of Energy Safety, Paul Fearon. ESV’s Sharife with Clown Doctors. The Humour Foundation is a national charity that supports sick children and their families by making them laugh – delivering ‘doses’ of fun and laughter. 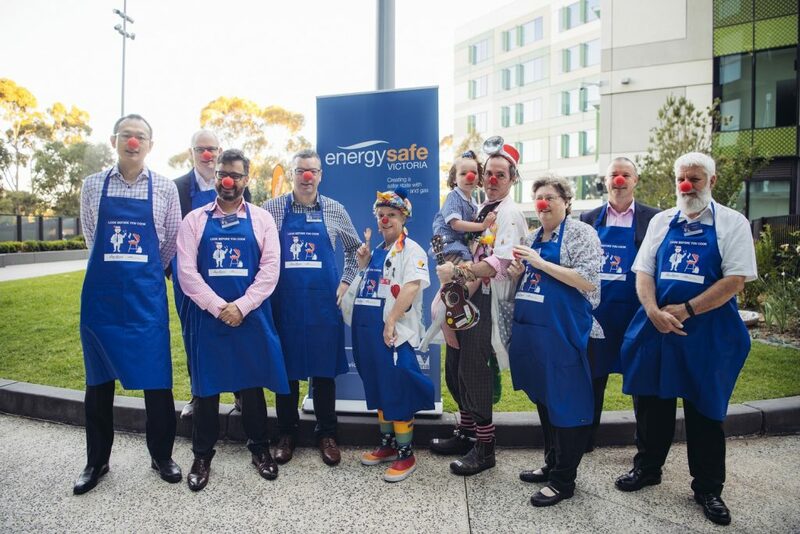 The Clown Doctors visit several hospitals across Melbourne, including the Royal Children’s Hospital, Monash Children’s Hospital, the Northern Hospital and Geelong Hospital, and many interstate. It is dedicated to promoting and delivering the health benefits of humour via its Clown Doctors. Their work is based (indirectly) on the work of Patch Adams. International research has found laughter to have both physical and psychological benefits for children undergoing medical treatment. 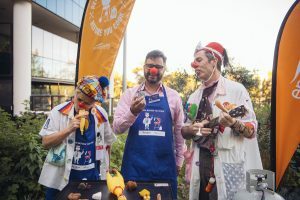 Its benefits are endorsed by medical professionals, including Dr Mike O’Brien, Head of Surgery at the Royal Children’s Hospital, Melbourne and a Clown Doctor ambassador. Warwick Teague, Director of Trauma and Burns Surgeon. Bubbles – the good kind. Treatment for burns is amongst the most painful and requires a dedicated Clown Doctor presence. The Clown Doctors receive specific training in dealing with distressed children and their families. While burns and energy safety have an obvious connection, the partnership is also meaningful to ESV staff, many of whom are parents who have attended the hospital with their own children for various reasons. Clown Doctors testing for gas leaks. 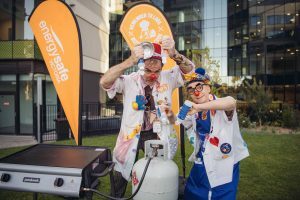 At the launch Victoria’s Director of Energy Safety, Paul Fearon said the partnership with the Clown Doctors would be key to ESV’s summer barbecue safety campaign Look Before You Cook. 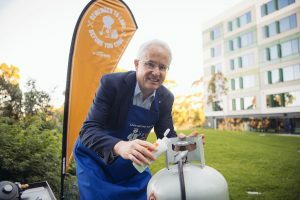 “We want to see kids enjoying the summer, not laid up in hospital particularly as a result of preventable accidents such as a barbecue fire,” he said. According to ESV statistics there were as many as one barbecue fire a day during the summer months. 40 per cent of barbecue fires throughout the year are caused by gas leaks. 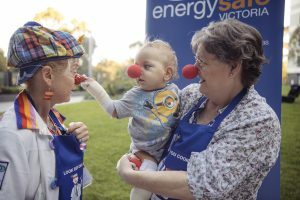 ESV plan to use the Clown Doctors to help promote other community safety campaigns, such as PowerSafe Buddies, an educational program for kids. Trend of the day – red noses and blue aprons. ESV people with RCH representatives and Clown Doctors.